Custom Dating & Match Making Mobile Application Development Company. The concept of Dating App is the most trending topic nowadays. People are aiming to build the most engaging and attractive Match-Making App. Dating App is a location-based social and dating application which facilitates communication between interested users. The app permits only person to start a chat with their matches, while both of them shows interest in each other’s profile. In the user app panel, user can create his profile and share all the details about him to find the best match. With the help of navigation menu, user can update his profile and see the connections and conversations to get all the details. User can Swipe User for Like or Dislike and if Like by Both then Get Connected for chatting. He will also get push notifications if anyone will message him. Update user’s profile & preferences. See user’s connection & conversation. User’s match list & their details. 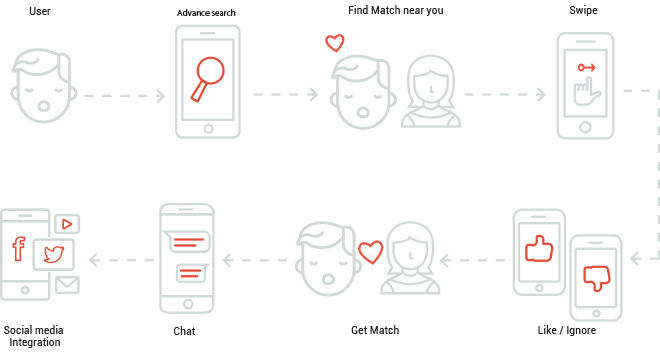 As user & his/her match connected, they can start chatting. As anyone of them, start chat they come in conversation state. User can sign up via Facebook, Google or email. User has to fill up his/her personal details & criteria to find a best match. Once both User & his/her match liked each other, they are connected & ready to start conversation. User can swipe right side for like (which means user is interested in that match). User can swipe left side for dislike (which means user is not interested in that match). Like matches will see User on top while discovering matches. Some of the preferences are taken from user side for find a better match. According to user’s set preferences, he/she get best matches with percentage (which will be calculated from user’s given criteria & his/her match’s personal detail). Admin can access the whole dashboard of the app. He will able to see every person who in present on the app and if got some report about anyone then he will take strict action against him/her. Admin has full right to manage the content of the app and he will be the one to update the app. Dashboard will show all the report and the annalistic of the user activity. Admin will manage all the content and can update the application. Admin will able to see all the people who got reported by other, and can take serious action against him/her. Admin will control user activity, can analyze the popular users; Admin can activate/ deactivate user. Dating Application is the most trending application now a days, everyone need his/her perfect match. You can generate revenue from this application into many ways. There would a membership plan through which user can have different membership and the extra/new features to access. How often do you cross paths with the love of your life before you actually meet them? User can sign up using Facebook, Google+ or normal Email method. After signup user has to setup his/her profile and set discovery preferences. How does Dating App work? After two people mutually opt in to connect with each other by swiping right, they’re added to each other’s match list connections. If you want to block user which comes on your home list then you simply swipe left to dislike it and that user will not appear again in your profile. If you are already connected to a user and want to block that user then go to that user’s profile, click on top right action button and select Block this User option.